to add a little more honey to change the taste. now performing some common sense miracle so I need you to read carefully. Now tell me, which other plan can be better than this? Prof thanks for the info but then how do will subscribe for the 10 gig and 1.5gig after recharging our account with one thousand naira. First of all, at anonymous 1, you don't need to subscribe for anything… just get a new sim registered, once you recharge N100, you'll be given 1GB for browsing and N500 for calls. Ignore 5H for calls and browse with your 1GB. The more you recharge the more you get. @Anonym 3. I guess I've answered your questions. All you need is a new sim. No code to dial because new sim automatically put you on startpack. @Baron Adigwe, you don't need any code to dial. Thanks prof, but I hope this is not part of the hidden cat you kept from us, bcos have seen this on so many forums and blog, and am still waiting for the 2 remaining cat you wanna unleached. That's not how to actually respond to a question. Every question should be handled equally no matter how sick. Calm down bro! 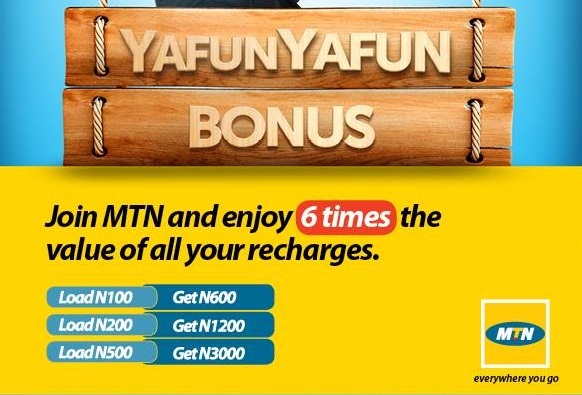 I don't think the data bonus is 1gb,i just read it from their website that the data bonus that comes with the new sim 500% bonus is 10mb on recharge of 200 naira and above. I downloaded Microsoft office 16 file of 2.2gb with 200 yesterday with it. Not interested, how can I be buying new sim cause of 11gb, when it's exhausted, what next? Buy a new si of course .. Mtcheeew.. Has anyone noticed that Mtn 500mb night browsing for N25 stops at 3:30am? And I notice that the N100 = N500 is around 500mb instead of 1gb. I recharged N200 and got bonus of N1000 and I set my data metre then I noticed that each 100mb consumed on PC about N100+ will be deducted from my N1000 bonus. but still ok for me. Mr Yomi, What is their validity to the GB. And i think MTN give just 10MB for every recharge. Or has it been updated? I just noticed it been blocked..around 50-100MB and your 500Naira bonus would be Zapped. I'm sure MTN will soon stop this package becos its already rampart on every site. That's grest if it will work. Am still enjoying my glo 10 gig . Meanwhile No need of imie tweaking for glo bb subscriptions since u can now buy glo 6gig for 2k. Prof, did as u said just now I didt make call went straight to my pc to start browsing it went 4 some time n stp working at 9.01mb…notin gong tru now..then I received an sms from mtn saying..your last session was 50000.00kb total cost of last session was 500 n new bal is 100.00…checked my bal now.0.00naria…what did I do wrong?? Was it a new sim ? Glo has offered us a better Data plan, una still want awoof. Naija, which way..
& i av 124mb balance atm. please connect before you can buy another new plan"
I have sent "CANCEL" to 777 yet still get the same message. Must i exhaust the 124mb before i can subscribe? THe question is, did you 124MB that you have, is it a blackberry bb data plan? If yes, then you are not suppose to exhaust it before you activate a normal plan. But if no, then you are to exhaust your 124MB before you sub for another plan. Oga Yomi! Please is this info still valid as some say it has been blocked? Don't want to go stress for another MTN sim for nothing. Mtn no thief , I recharged 2k and it was working for 2 days but whipped on wed.